Rumi, race, and religious persecution—the work that appears in this issue of e*lix*ir explores a wide range of themes that, at first glance, may seem to have little in common. A closer look, however, reveals that a single, bright star guides these explorations: the conviction that art is not only a means of personal expression, but also a powerful instrument of social change. A classical Persian poet and master of mysticism, Rumi is revered the world over for his powerful evocations of mystical encounters with his Beloved. In his poems, he invites the reader to witness, even enter into, a condition characterized by the exhilarating self-forgetfulness that comes from immersion in the divine “other”—God, as Rumi accesses Him through his spiritual master, Shams. But is the condition so vividly conjured in Rumi’s poems impossible for other artists to experience if they do not seek to advance along the sometimes elusive, often arduous path of the mystic? Or can such experiences of ecstatic union with a divine “other” have their origins in everyday encounters available to any artist who wishes to draw upon them for inspiration? But it is also true that the radical gesture of self-forgetfulness that lives at the heart of genuine social activism can offer the artist one of the most potent elixirs he or she might ever be blessed to imbibe: the heady brew of immersion in another kind of divine “other,” what William Blake calls in one of his poems “the human form divine”—in other words, our fellow human beings. How does the artist engage in such social activism? As artists, we effect change through the generous act of sharing our spiritual bounty in art that uplifts the soul. Through such art, we inspire others to ponder more deeply and to live more fully. Such art awakens us to the possibility of living more purposeful lives. For at the heart of true social activism and genuine art lies one incontrovertible truth: what we create shapes us and, in turn, our communities. Our art not only reflects who we are but what we wish to become. And so it is for readers and for art lovers: they are changed by the art with which they choose to engage. The artists whose work appears in this issue of e*lix*ir do not ride the wave of the latest fashion in art; rather, we seek fresh horizons of creative endeavour, new lands, uncharted territories. We are explorers. Our quest is to create an art of true and enduring value. This journey takes us through the very field Rumi describes in one of his poems—the one “beyond ideas of wrongdoing and right doing,” where “the soul lies down. . . .” I imagine this place as a meadow in which crimson poppies blow (poppies cultivated not for opium but for the seeds used to make cakes! 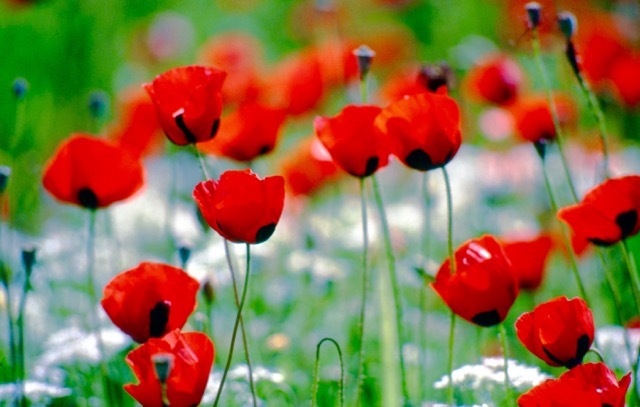 )—for poppies are native to Konya, where Rumi spent much of his life and is also buried. The work showcased in this issue of e*lix*ir embodies a search to create what is of true and enduring value. In the work of Burhan Zahra’i, pen and ink is married to digital technology and graphic art to produce a style of calligraphy that is both traditional and innovative. In his novel, Shahin Mowzoon imagines the discovery of a diary belonging to Rumi and what this might mean to a world hungry for truth. In Nine O’Çlock Blue, Teresa Langness explores the challenging issue of race, taking us to L.A. in 1992—the scene of some of the worst race riots in recent times. In my own “Celestial Navigations,” a long poem inspired by one of Bahá’u’lláh’s mystical Writings, the Tablet of the Holy Mariner, three lost souls set out on an epic sea voyage and find themselves in a Persian garden—Bahjí, the resting place of Bahá’u’lláh, near Akka, Israel. In his essay on Margaret Danner, Richard Hollinger brings to light the important contribution of a little known African-American poet who created at the intersection between the Black Arts Movement and the Bahá’í Faith. Poet Anthony Lee fills “The Writing Life” column with his hard-earned wisdom about the art of translation and its place in the global community. And in “Looking Back on Books,” we revisit Lee’s translations of Rumi and Táhirih, and those of Rumi by Frank Lewis, a scholar with the spirit of a poet. In this issue, we introduce a new section—the “Voices of Iran.” In the inaugural essay, “Reading Anne Frank in Isfahan,” Sahba reflects on the plight of the Bahá’ís of Iran. It is my hope that this section of e*lix*ir will offer a space where Iranian voices can speak and be heard. Finally, we welcome Bev Rennie to e*lix*ir as staff photographer: her images will continue to grace the pages of the journal. In the Bahá’í vision, the processes of personal and social transformation are inextricable. We heal the world by healing ourselves. We heal ourselves by healing the world. Art, that well-crafted instrument of change as well as joy, thrives at the heart of both processes. In this spirit we present the third issue of e*lix*ir: let it change you, let it bring you joy! * Paris Talks, p. 175.